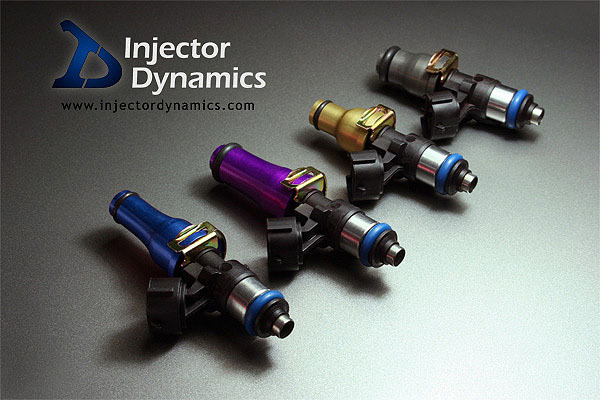 Injector Dynamics uses a scientific approach of offering some of the highest flowing and best performing injectors for any street or race car. Their dynamic matching method ensures each injector in a set will flow within 1% of the other injectors, which is among the tightest tolerance in the industry. The full pressure range is also tested to ensure that there are no surprise dead spots to cause future issues. The consistency and accuracy of each injector set is unlike any other injector supplier, and Injector Dynamics has quickly made a strong name for themselves in the ultra-high performance applications. They are a 48mm long body, shorter than normal injectors. The adaptor tops make them "normal" 60mm length and adapt them to 11mm (B series) or 14mm (K series) orings. The K series guys can run the injectors with no adaptors at all and they are the same length as the OEM rsx injectors so no spacers needed on the rail. The proper battery comp values are also provided with each set so you can set it up in your computer and have consistent a/f ratios as battery voltage fluctuates. Most other injectors don't offer that information at anything other than 1 voltage level. The high pressure and excellent atomization makes these are great option for high power N/A applications as well. Excellent low pulsewidth response, linearity within 2% all the way down to 2ms, predictable response down to 1.5ms. Using a 3 dimensional battery comp table with Motec V3 software, low pulsewidth response can be linearized to practically zero flow. Ruler flat response, unmatched linearity means easy tuning and accurate compensations.